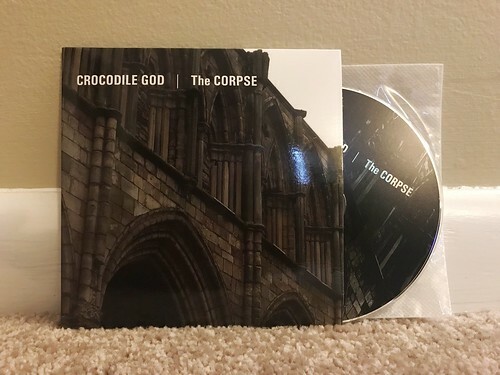 This CD out on Fixing A Hole in Japan pairs 90s UK punk stalwarts Crocodile God with Japanese newcomers The Corpse. A split with a UK band on one side and a Japanese band on the other is something that I've loved since I started buying Snuffy Smile 7"s back in the mid 90s. While the concept of a split CD is still a little weird to me, this release brings me back to the glory days of discovering incredible new bands. Crocodile God is a band I've been listening to for over twenty years. Their brand of fast paced and catchy punk rock is one I'll never get sick of. Though on this release, two of the three songs included are also on their split 7" with Not Tonight & The Headaches. Both songs are still as good as they were on that 7", but for me at least, they aren't new to this release. What is new is an acoustic version of their song "Ladders." This has always been my favorite Crocodile God song ever since I picked up the 7" it was on that Crackle put out. Hearing it in an acoustic context really highlights what a damn perfect vocal melody they came up with for this song. It's a little slower than the original (which is typically the case with acoustic versions of punk rock songs), but it's just as excellent. The Corpse turned in one of the highlights of the recent Tribute To Broccoli CD with their version of "Chestnut Road." I'm happy to report that the three original songs on this split are just as great if not better than their Broccoli cover. All three songs are perfect example of the sort of melodic punk rock I like to listen to. There are times where they remind me of some of the classic Snuffy Smile bands of the past, but at the same time they elevate their songs with more complex arrangements that remind me a little bit of Summerman, though with the distorion turned way up and the tempo much faster. In all honesty, these three songs are some of the best I've heard all year. I really hope The Corpse puts out some more records really soon. Thanks Tim! I'm recording a full acoustic album this year and am looking for someone to put it out, spread the word brother! !